Bangkok (Thailand) – December 11, 2018 (travelindex) – Best Western Hotels & Resorts has launched a brand new website that provides essential information to hotel developers and owners in Asia. 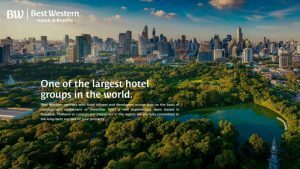 The new website, which is now live at www.bestwesternasiadevelopers.com, is dedicated to hotel developers and owners, offering a complete source of content for any company or individual looking to harness the power of Best Western’s global brands to enhance the value and performance of their property. The website offers in-depth information to all existing, new and potential development partners. This includes an interactive map that allows users to visualize the company’s existing portfolio of hotels and resorts in Asia, and an overview of Best Western’s regional pipeline of properties. Visitors to the website can also discover the strength of Best Western’s reputation by exploring the company’s many industry awards and extensive media coverage. The “Why Choose Best Western” page reveals the many advantages of working with Best Western, such as the company’s highly profitable business models, which include management and franchise options with attractive fees. There are also details of the services provided by Best Western’s central support network, including global sales, marketing and distribution, revenue management, professional training, state-of-the-art technology, quality assurance and access to the award-winning loyalty program, Best Western Rewards®. Developers can learn more about Best Western’s wide-ranging portfolio of brands. With 13 distinctive and innovative concepts to choose from, ranging from economy to upper-upscale, Best Western has an option to suit almost any property type or location. The most recent of these brands, Sadie HotelSM and Aiden HotelSM, which launched in September 2018, are dedicated to conversion projects. These are now available alongside the timeless trio of classic brands, Best Western®, Best Western Plus® and Best Western Premier®. The brand portfolio also includes Vīb® and GLō®, the cutting-edge midscale concepts that are tailored to new-build projects; and two soft brands, BW Premier Collection® by Best Western and BW Signature Collection® by Best Western, which allow owners to retain their distinctive style and identity. Meanwhile, Executive Resid ency by Best Western® enables developers to tap into the modern trend for extended stays. Finally, the recently launched franchise offerings, SureStay® Hotel by Best Western, SureStay Plus® Hotel by Best Western and SureStay Collection® by Best Western, provide three ideal options for owners and developers who want to avoid high costs, whilst also harnessing the power and support of a global brand.